If you choose to live, work, and play in California, then chances are that you love our state and want to see the quality of life maintained. Speaking from the standpoint of a local business and member of the community, the whole team at Greg’s Petroleum Service wants that too! So, this month we want to share some information about how the industry we’re in contributes to the overall quality of life, and how we’re striving to be a good neighbor as a commercial fuel and lubricant supplier in the California community. We suspect that there’s quite a bit that people don’t know about the positive contributions oil and gas are making to keep up a high quality of life for people — friends, family, loved ones, and neighbors. For that reason, we want to share some of the facts about the ‘state we’re in’ with you this month. 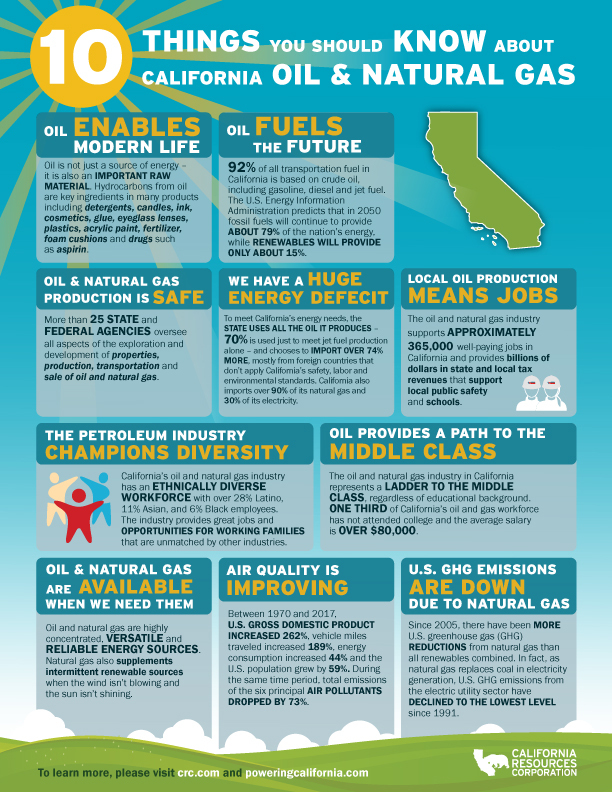 In that vein, we’ve compiled a list of five things you should know about the California oil and natural gas industry. Full disclosure, we pulled our information from the California Resources Corporation, the largest oil and natural gas producer in California on a gross-operated basis. 1. Local oil production supports our economy with a significant number of jobs and opportunities. Did you know that the California oil and natural gas industry supports nearly 368,000 well-paying local jobs? That amounts to number of families supported, who can put that money back into our economy when they buy other goods and services. 2. Jobs in the oil industry provide a path to the middle class, regardless of educational background. Consider that the average salary in our industry is $84,000 per year, even though approximately one-third of the workforce has a high school level education, or less. We provide solid jobs that support families comfortably. 3. Additionally, natural oil and gas revenues are taxed at a rate that provides billions in revenues that support state and local public safety and schools. That money supports the infrastructure families rely on in the community and provides opportunities for our future. 4. The local natural gas and oil industry supports the diversity of our community. California is ethnically diverse. Our industry not only reflects that but supports it to strengthen our neighborhoods. We offer opportunities that are unmatched in other industries. Consider that the industry local workforce is 29 percent Latino; 13 percent Asian; and 5 percent Black. 5. Our industry is a responsible member of the community concerned with maintaining air quality standards. Consider that between 1970 and 2016, the total emissions count of the six major pollutants dropped by 73 percent. That’s huge, when you consider that production, driving miles, and the population grew by 44 percent. We’re doing our part to be efficient and responsible, to maintain a high quality of life even as demand increases. Are you surprised? Want to learn more? You can check out additional statistics provided here. As a commercial fuel service provider and lubricant supplier in California, Greg's Petroleum Service is a proud member of the local natural gas and oil industry. We are proud to serve our customers with the information, resources, products and services they need to keep serving our economy and the people who live in California … and those that rely on our products and services across the country. If you have additional questions, or want to know more, please feel free to reach out to us directly. We look forward to hearing from you! If you need additional information, please know that the team at Greg's Petroleum Service is here to help. As your commercial fuel delivery service provider and lubricant supplier in Bakersfield, Fresno, San Luis Obispo, Santa Clarita or Ventura, California areas, we are available to help answer any questions you might have. Visit us online or give us a call to learn more. Major lubricant suppliers have announced a coolant price increase of all concentrated and diluted products up to 5% due to increasing costs of raw materials impacting the manufacturing of products. In certain instances, specific products may increase in amounts that are outside of this range. Chevron, one of our major antifreeze and coolant manufacturers, announced that this price movement will be effective on November 19, 2018. Competitor manufacturers such as Shell, announced it’s 5% coolant price increase will be effective November 30th, citing raw materials, glycol and market dynamics as the primary cause of this increase. Prestone and Old World’s price increase is already in effect as of October 15th. We encourage you to place your antifreeze and coolant orders as early as possible to benefit from our current price levels, which allows us to meet your needs and requests in as timely a manner as possible. We understand the impact of this news and how it may affect your business. We will strive to support your business by creating a plan to manage the price increases the best way possible. Greg's Petroleum Service strives to deliver quality products at affordable prices. For questions on how price increases across the industry may impact you, please contact us today. Are you a California farmer and agricultural producer? This fall, as we move through harvest season, is the perfect time to consider how the best use of oils and lubricants in your valuable fleet of machinery can make all the difference to the outcome of your efforts. As a farmer, regardless of whether you have a small- or large-scale operation, you know that future growth and return on your investment is always the product of long term thinking and planning for the future. And just as you know how to plan for planting and harvest, you too need to have the know-how in place to care for farm equipment. The right choice of oil and lubricant to use for each piece of equipment is one of those critical decisions that yields dividends with each additional season in which you’re able to get the most out of your truck, tractor, or picker. We know your machinery is important. Poorly maintained equipment can take a bite out of your yield through lost productivity and the need for costly replacements and can also eat away at the investment you make. But you can ‘sow the seeds’ (so to speak) to get more out of your equipment, simply by making wiser choices in oils and lubricants. As a commercial fuel delivery provider to the agricultural industry in California, we have several recommendations to help you make the most of your machinery. But first, some context. If you’re concerned about maintenance of your agricultural fleet, you’re not alone. We’re proud to service such a strong local agricultural industry! In fact, a recent tour brought southeast United States farmers to tour the San Joaquin valley to learn more about how to manage large scale, diversified crops. You can read more about that here. In California, major crops include almonds, pistachios, tomatoes, cotton, garlic, grapes, corn, carrots, peppers, seed lettuce, seed alfalfa, and strawberries. What that means, from the standpoint of machinery care and maintenance, is that local farmers must be savvy about protecting equipment used in a wide variety of applications to maintain productivity. And this list of equipment isn’t anywhere near exhaustive. So, what are the practical applications to consider in choice of oil and lubricants? And what tips can we give? Read on for just a few of the important items to consider when making your choices. 1. Consider whether the machine or piece of equipment will be subject to temperature changes leading to condensation. Will the truck be making lots of cold startups, and short trips? Does the gear in your machine run all day and generate high temperatures? In these cases, you might want to look for a lubricant with a higher viscosity. 2. Will the piece of equipment come into contact with corrosives, such as the use of fertilizers and chemical spraying? In those cases, look for oils and lubricants with additives to counter rust and oxidation. 3. Is the equipment likely to be subject to a lot of dust and dirt contamination, as is routine in outdoor and industrial settings? In many cases where contamination is an issue, it’s a better choice to pick a mineral based oil based on cost, as you’ll be changing oil more frequently. And that’s just a starting point. There are additional factors to consider. Most importantly, you must remember that one size doesn’t fit all. It’s not a good idea to choose a single oil and expect it to work well for every piece of machinery in your fleet. Finally, it pays to get expert advice, if you don’t know what you need! As your fuel and lubricant supplier, we are able to help you make decisions for each piece of equipment. Here at Greg’s Petroleum Service our team can help you determine when to use a synthetic, versus when the better choice would be an oil with a mineral oil base. We provide commercial fuel delivery and lubricants in Bakersfield, Fresno, San Luis Obispo, Santa Clarita or Ventura, California. Don’t hesitate to reach out to us with any questions. We look forward to serving you!